I happen to be a lady who loves color, especially in the spring and summer. There is no better way to bring myself out of the NY winter funk then to enjoy the blue skies. 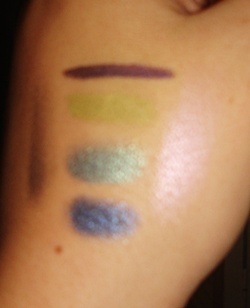 I just received my Lancome color palette in the mail (review coming soon!) and one of the shades is a wicked dark blue which inspired me to do a blue smoked out eye with a touch of green and plum to celebrate to coming summer. To start I washed, prepped and primed my face and then applied my normal foundation and concealer routine (I held off on the powder till the end, you’ll find out why!) Because the blue family is so bright and vibrant I wanted my face to stay neutral to avoid the clown effect. I then primed my eyes with Cult pink primer and started building the blooms. I wanted a good mixture of colors, so on top of the blues I have sage, plum and pink as well. For the base color I used Sephora eye shadow in sweet candy, which is a baby doll pink, and I applied it all over my lid and up under the brow line with a medium brush. 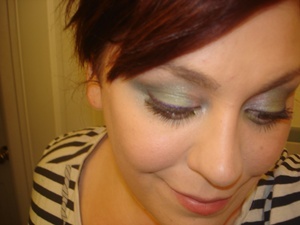 I then took my blue base which was Maybelline eyeshadow in turquoise jewel, which is a brilliant blue shade with a hint of sparkle, and blended it in on the lower lid up into the crease of my eye using the same medium brush (make sure to wipe brushes if you use the same one so you don’t mix before blending) I then continued to sweep the turquoise under my lower lash line for dramatic effect. Next I took my sage pot of gold I call it (it’s an old loose powder that Victoria’s Secret used to carry but any light green/sage color will do) and worked it from the center of my lid blending it out to the corner. For a little extra drama I used this green on the bottom corner of my eye. It is very important, especially with bright colors to blend if you want a smoky effect, so with every color I built on I would blend as I went! I then grabbed my glorious midnight blue from Lancome’s Midnight Rush palette and blending it from the outer corners up to the crease and out to the corners smoking and blending as I went with a medium brush and finished it off with a blending brush. corners of my eyes. Last step was to curl and coat my lashes using L’oreal million lashes mascara. I finished off with my setting powder at the very end, this way I could also use to powder brush to sweep away any fall off from the eye shadow powder, which will happen with high pigment powder. The best part about a high pigment color look is that it can be achieved with any color you wish. 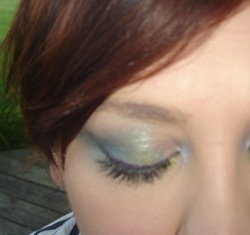 It’s a great smoke effect with pinks and plums, greens and purples, even yellows and oranges! It really depends on your mood. 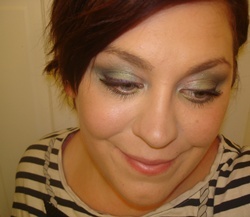 The end result was a great summer look which I wore out that night to celebrate the warm weather and the frozen drinks. *For my face I used Maybelline fit me foundation, concealer and powder in #210, Avon minerals blush in wine, Covergirl Lipstain in peach and Avon eyebrow pro in dark brown.